For the last month it seems like the internet (or at least the websites I frequent) has been achatter with discussions about young people leaving and/or coming back to the church. First there was a little article floating around facebook and elsewhere by a young Christian woman who warned churches that changing their rhythms and practices to try and draw a younger crowd might not be the brilliant idea many people think. In her own life, she explained, the hip, 'contemporary' worship was attractive for a time, but now that she's a little older she's drawn to the more traditional services she grew up in--and she's not the only one who feels this way. So, she advised everyone to "change wisely." After this, the dam burst and the articles and reflections started pouring through. One former pastor argues that what Rachel calls for is really just another form of “tweaking”—and besides, he says, the church is already dead to millennials anyways. Another fellow, a long-time Methodist turned Presbyterian, suggests that the church Rachel describes, the church the millennials are supposedly looking for, is the United Methodist Church (but, he adds, since millennials clearly aren't rushing into our churches, Rachel must be missing something). Then a young woman, writing for Christianity Today, warned that the church's preoccupation with youth leaves middle-aged and older women feeling unimportant and unwanted--we can't just focus on millennials. At the same time as all of this, one United Methodist complained that young Americans see the denomination as "completely irrelevant" because its primary concern is "how to perpetuate our own institution." In other words, we are more interested in attracting more and younger people than in being a church that is a light of the world. All of that is just a small sampling of the chatter. I'm not sure why this topic became such a firestorm here lately, but of course it is something on a lot of people's minds--especially in a church with an older average membership like the UMC. Now, I don't believe most people are worried simply because they want to ensure their church's survival. That does happen, no doubt, but a lot of people are probably worried because all of the statistics and everything they're seeing with their own children and grandchildren makes it seem like the faith might disappear altogether in the US in the decades ahead. And that's a terrifying prospect, for all kinds of reasons. And so our minds naturally return to the question: how do we get the 'young people' in church? What do we have to do to draw them in? Do we change 'wisely'? Do we need to make substantial changes rather than stylistic changes? Do we just need to advertise better, work on our image, so that millennials will realize that the UMC is actually their dream denomination? What do we need to do? After the first piece started making waves online, a former classmate of mine made an observation that I think a lot of us need to hear. The church's constant struggle to "attract" people will only ever get us off on the wrong foot, he said, because "the idea of people streaming into Jerusalem is something the Bible only imagines eschatologically"--that is, something we only see in eternity (for instance, Isa 2:2). Folks don't just come to worship the Lord and be a part of his people. We call people who begin searching for God in the church "seekers," yet in scripture God is the seeker. God's the one who goes looking for that one missing sheep (Luke 15:3-6), who turns the house upside down in search of that lost coin (15:8-9). Jesus came to seek and save the lost (Luke 19:10). And Jesus' people are called to "go" and carry on his mission in the world. "As the Father has sent me, so I send you" (John 20:21). I don't know what we should expect the religious landscape to look like in the United States in 30 years--I don't even know what the United Methodist Church will look like then. It will probably look very different. But I do know that we aren't called to draw people to the church house, to attract the young folks (or anyone else) to our worship services, as if we could just sit back and watch them stream in. We are called to go and make disciples, go and let our lights shine before others out in the world, so that they might see those works and give glory to God. Ministering to the next generation, to any generation, is a call to go and proclaim the gospel of the Kingdom of God to them with our words and our lives--with our love. Instead of asking how to attract younger people to the church, maybe we should ask God where he would have us go and what he would have us do. 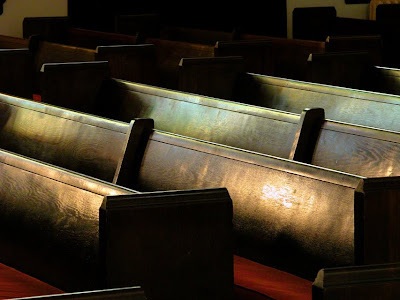 And, frankly, whatever trends we see in church attendance, whatever dire prognostications we hear concerning the future of church, I'm not worried. Why? I'm not worried because Jesus Christ is the head of the church (Col 1:18) and its cornerstone (Eph 2:20). Not us, not the strategies we come up with or the numbers we obsess over. Jesus Christ. That's all the assurance I need. The church is not going anywhere.